An interlock of strategy, tactics, and chance. hose of you searching for an Avalon Hill war game, proverbially if not literally, available through Xbox Live Marketplace: we now have one. Part card game and part board game, Panzer General: Allied Assault tightly interlocks strategy, tactics, and chance; tendering rich strategic play for casual sittings. Simplicity rules. 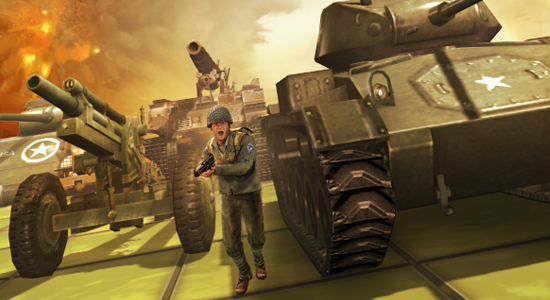 Every battle in Panzer General, from the Normandy invasion to Berlin's frenetic Ardennes Offensive in the single-player campaign, to competitive matches on Xbox Live, conforms to a five-by-six grid. Players draw from shuffled, sixty-card decks: twenty units, forty more cards for use in maneuvers or combat. Straightforward objectives — eliminating the enemy, occupying designated squares, or capturing three adjacent squares along the board's opposing home row — require less than ten turns, while some missions demand victory conditions met within six. Every battle conforms to a five-by-six grid.Akin to chess, this unadorned platform supports many variations of a limited and reliable format. From scenario to scenario, each square has terrain or structures assigned to it, introducing gameplay elements while reflecting (if not exactly simulating) historic sites. Most sessions won't nearly exhaust a card deck, so the materiel and advantages made available to a player — as in a round of Magic: The Gathering — result in unique experiences that require close attention to the state of the board. Players can only accomplish missions by advancing, but establishing front lines and entrenching key units will mark the difference between lucky wins and calculated victories. Where Panzer General distinguishes itself, luring players back for just one more try, is in torquing strategic decisions such as deployment and movement with tactical gambles and the rolling of dice — generating a mechanical advantage for gaming smarts. When a unit attacks another, players spend points to reveal cards from their hand that modify the engagement. Attack power may be increased, defensive scores attenuated, fortifications nullified, units weakened or even immediately destroyed. Neither deliberation nor assertion are penalized; if one player passes and the other plays a card, the first player may choose to play a card in response, followed by the second player. As this exchange ends only when both players pass, by choice or if lacking cards or points with which to spend them, great stakes may be raised for a single assault. Choose wisely: the game generates a mechanical advantage for gaming smarts.Then, each player may discard a card from his hand and add its listed value to his unit's attack or defense score. Again there is both a risk and an art to this: several cards of limited usefulness carry high values, and readily contribute to a reversal of fortunes — especially if the other player is unable or unwilling to produce a high-value card. Finally, a die is rolled; and it, too, can overturn a probable outcome. If a targeted unit survives an attack, the other player's units return fire, a reminder of the wisdom of meetly preparing a battlefield. And that's it — the joy of a game that is purely mechanical. Panzer General's graphics, music, and sound effects befit a strategy title; which is to say they aren't impressive. They're helpfully incidental, too. Armor could be replaced with cavalry, infantry with footmen, artillery with archers and trebuchets. Whatever. The game is set, like clockwork, and need only be decorated. Hundreds of years on, and still a pinch of delight when you take a pawn en passant. I thoroughly enjoyed my time with Panzer General. Your allusion to "Avalon Hill-style gaming" was spot on, Mike. The only gripe I had pertained to the length of combat: giving both attacker and defender full cardplaying phases certainly extends the length of encounters. The developers chose to favor balance over speed: certainly a sound decision.